The portrait features a mature woman looking straight forward; the face is characterized by wide eyes, hooked nose, tight lips and a receding chin. The hair is arranged in a high crown of curls framing the forehead and is tied back in a number of tiny braids fastened in a bundle on the neck. The head is surmounted by a diadem, an ornament which is usually associated with members of the imperial family. 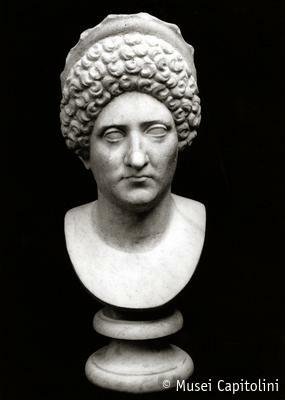 It has been suggested, though not convincingly, that the portrait may be referred to Domitia, the sister of the emperor Hadrian. The coiffure and the lack of drill-holes in the hair, however, date the portrait to the early 2nd century AD, the age of the emperor Trajan.